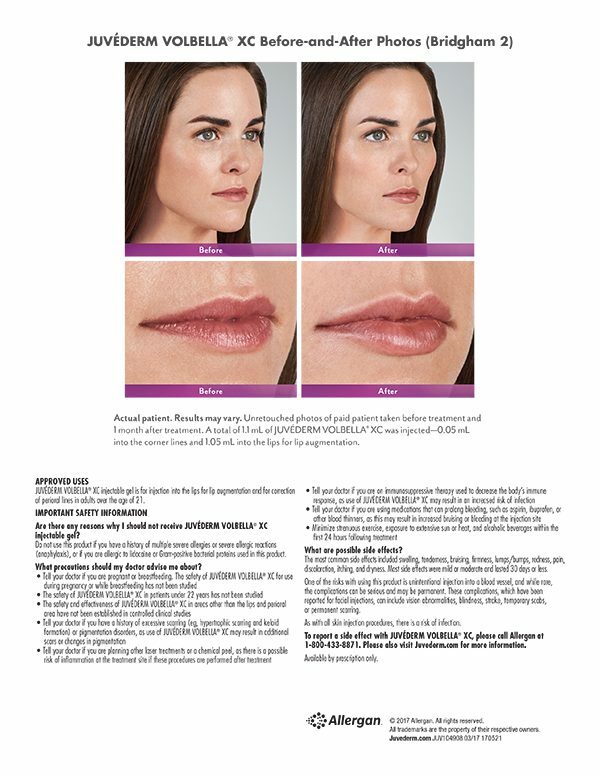 Proven to last up to 1 year, Juvéderm Volbella® XC is a uniquely formulated filler designed to fill fine lines and wrinkles around the lips while providing subtle lifting. Have you been dreaming of fuller lips? Some people have naturally thin lips and want to achieve a fuller appearance, other people have just noticed their lips thinning and vertical lip lines becoming more noticeable over time. Whatever your unique needs are when it comes to your lips, Juvéderm Volbella® XC has the solutions. Juvéderm Volbella XC injectable gel is a smooth, clear, colorless hyaluronic acid gel, which adds volume to your lips and fills fine lines and wrinkles. Hyaluronic acid is made naturally by the body, but production slows as time goes on. Thankfully cosmetic companies have figured out how to produce hyaluronic acid synthetically, and it can now be used as a facial filler. Hyaluronic acid attracts and retains moisture, giving your mouth added contouring and definition, which is one of the main reasons why Juvéderm Volbella XC can add volume to your lips and reduce lines while keeping a natural look.